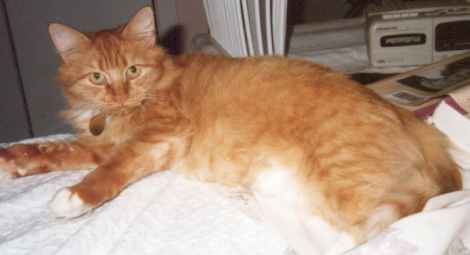 Muffin was adopted as a kitten by Suzanne in 1998. She has grown up since then, but still has enough "kitty" in her to get a good workout daily. 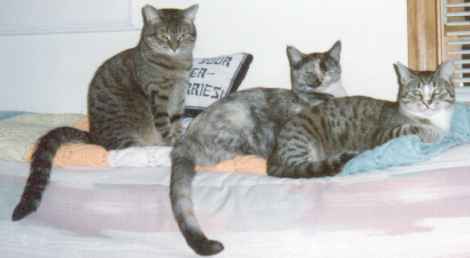 Kathy sequentially adopted Louise, Clarice and Nuke (left to right) in 1996. They get along very well and are helping their owner write her doctoral dissertation by walking on the keyboard, perching on top of the monitor, swatting at the cursor, and of course, playing with the mouse. They will be moving cross-country when Kathy returns to Seattle in November 1998. Bob and Diane write: We call him "Ralphie the boyo," "Sir Ralphin," Ralphie or his given name "Ralph." It doesn't really matter because he won't answer. He's deaf and blind in one eye, but he has been one of the most precious pets we had the pleasure of sharing our home with. He was born in a barn in April of 1994. The runt of the litter, he was very carefully nursed along by the volunteers at Kitty Angels until they met us at a pet store. We already had one cat, a chinchilla, a rabbit and a dog who was diabetic and blind. Our two daughters, one of which was physically disabled rounded out the family. After hearing about our household, the volunteers thought "Ralph" might fit in just great! They asked if we would serve as a foster home while he underwent eye surgery to remove the cataracts that clouded his sight. Our other cat "Tigger" was the same age so we thought it might work out. Ralph started out as a foster kitty but soon became a member of our family. During his procedures he was quarantined in a private room. Our experience with disabilities transferred to making his recovery as accessible as possible, with a television that stayed on all the time to encourage him to use the vision he was developing, and five foot pillow ramps to help him navigate up onto the bed so he could have a better vantage point for watching his favorite cartoons. Do cats see in color? We don't know, but we could see him watching, and knew he was improving! By the time all the procedures were done we couldn't bear to see him go. He ended up staying with us, and has been a joy to observe. He has continued to improve steadily and seems to have no problem with the fact that he can only see out of one eye. He is able to scale anything in the house if given the opportunity of stepping stones. His favorite place to sleep is on top of my daughter's cable box which is seven feet off the floor. He simply hops up over cabinets and bureaus to get there and snuggles up for the night. Anyone given the opportunity to adopt a cat with a disability should jump at the chance. It can be truly amazing to see how they adapt!